In many ways—both academically and athletically—Wake Forest is a spitting image of Boston College. As far as student population is concerned, the two schools, along with Notre Dame, round out the bottom fifth of the ACC’s enrollment rankings. Not only that, but they also boast acceptance rates teetering on the 29 percent line. When it comes to football, though, the comparison is uncanny. Over the course of the past four seasons, Dave Clawson’s Demon Deacons have posted a combined 20-20 record. During that same span, BC has strung together 19 wins and 21 losses. Looking at the programs’ arch of success is even crazier. Both teams limped to a 3-9 record in 2015—the same year in which they faced off in one of the ugliest ACC games in recent memory, a 3-0 Wake Forest win. The next season, the programs rebounded with seven wins and a pair of lower-tier bowl victories. 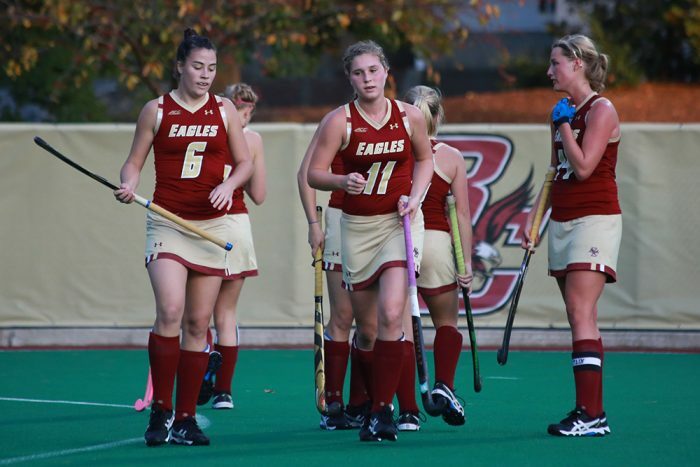 In 2017, the Demon Deacons blew out BC by 24 points, but thanks to the Eagles’ 5-1 second-half finish, they came within one game of matching Wake Forest’s eight-win campaign. Fast-forward to this fall, and both are off to 2-0 starts. They’ll have a chance to create some separation on Thursday night, when the two schools square off in the month of September for the third time during the Addazio era—that is, of course, barring any kind of postponement or cancellation. In just a matter of days, Hurricane Florence has transformed into a Category Four storm that’s set to hit the East Coast, specifically the Carolinas, late this week. Due to the fact that the Eagles are playing in Winston Salem, N.C., there’s a chance game time could be bumped up to the afternoon or perhaps delayed in some sort of fashion. This isn’t the first time that BC or Addazio has dealt with an impending hurricane. Back in October 2015, the Eagles traveled to Durham to suit up against Duke in the wake of Hurricane Joaquin. At the moment, Addazio doesn’t know when or if the game will be played. He’s solely focused on Wake Forest, so much so that he didn’t even get a chance to talk to fans or alumni about this past weekend’s old-school reunion between BC and Holy Cross. Luckily for the sixth-year Eagles coach, he’s preparing for a Demon Deacons team that’s remarkably similar to the one he saw last season. In SB Nation’s returning production rankings, Wake Forest is listed 37th in the country, having brought back players—namely their leading rusher, an explosive wide receiver, and their entire offensive line—that make up 72 percent of the team’s 2017 output. Some point to the loss of starting quarterback John Wolford, who racked up 39 touchdowns in a breakout senior season, throwing 29 scores to just six interceptions—but Clawson has a new guy behind center that Addazio thinks is just like Wolford: true freshman Sam Hartman. Hartman, who is filling in for supposed starter Kendall Hinton—a redshirt junior that was suspended for the first three games of the season after violating team rules this summer—has lit up the box score in his first two collegiate appearances. The Charlotte, N.C. native has logged 620 yards and four touchdowns through the air, completing 61.5 percent of his pass attempts. As hard as it is to adjust to the college ranks, it’s a lot easier when you have Greg Dortch on the perimeter. He receives high praise from coaches around the nation, including Addazio. Just a sophomore, the 5-foot-9 receiver has already established himself as one of the ACC’s top offensive weapons. Hot off a seven-touchdown rookie season, Dortch has hauled in 19 balls for a 243 yards and a score this fall. Throw in the fact that he housed a pair of punt returns this past weekend against Towson, and you have yourself one of the more dynamic wideouts in the country. Equipped on the outside, Hartman can sling it at will, but he’s dangerous on his legs too. Having already carried the ball 22 times, the dual-threat quarterback has recorded an average of 64 yards per game on the ground. Still, the true freshman that he is, Hartman is imperfect and turnover prone. There’s no doubt BC will try to pressure him from the moment the game starts. Forcing a few errant throws is the first step to winning the takeaway battle—one that the Eagles badly lost in last season’s matchup. In the 34-10 defeat, Anthony Brown was intercepted three times, and Jonathan Hilliman coughed the ball up inside Eagles territory. Meanwhile, Jim Reid’s defense failed to create a single turnover. In a matchup that could be drastically affected by weather, it could very well take one miscue to tip the scale between two teams that, despite year-to-year projections, have ended up in the same nest on a season-to-season basis.